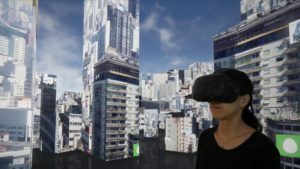 The exhibition will feature the most innovative artworks that experiment with augmented and virtual reality, create immersive environments, and explore complex relations between the “virtualities” and “realities” of our post-media society with its networked communities and migrating cultures. 10.000 Moving Cities – Same but Different deals with urbanization and globalization in the digital age. The user moves through visual worlds posted publicly by others on social networks such as YouTube, Flickr or Twitter. Here these personal impressions are streamed in real time like windows to our changing world. The viewer participates in the social movements of our time and makes a virtual journey into constantly new image and sound collages in which one experiences local, cultural and linguistic differences and similarities. 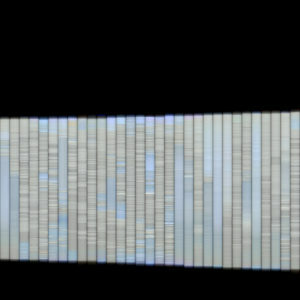 In virtual space, this information is visualized on cubes that rise at different heights to become a kind of skyline. The work deals with how our cities are continuously changing and increasingly resemble one. This results in more and more non-places/places of lost places in the sense of Marc Augé’s book and essay Non-Places, which could exist all over the world without any true local identity (mostly anonymous transition zones such as motorways, hotel rooms or airports). The work is the digitized version and further development of 10.000 Moving Cities, which was exhibited at the National Museum of Modern and Contemporary Art in Seoul (2013/2014) with real cubes. It is at the end of the dike, in Fecamp down the lighthouse, that I like to settle watching the coming and going of the waves. The sea flows towards the beach. She raises herself against the wall to return and push the foam on the return of her path, while the next wave already digs his. It never stops. It calms down. That intensifies. Through my eyes, slipping inside me, I forget the time and I look, I think of nothing. The foam occupies my heart, and the wind protects me from the rest. There, at the foot of the lighthouse, I meditate…. A major figure in the French digital art and avant-garde film scenes since the late 1990s, Jacques Perconte (born 1974, lives and works in Paris) considers himself a visual artist. He concentrates on the landscape, utilizing a variety of forms including linear film for cinema and generative film for exhibition/gallery, audiovisual performance, photography and installation. His primary focus is to examine our ongoing cultural and technical relationships with nature. With “Rek” (stretch in Dutch) Juuke Schoorl explores the aesthetic possibilities of the human skin through a mixture of image capturing techniques. By manipulating this curious stretchable material with various low budget materials like nylon thread and cello tape she is able to temporarily shape it into surprising textures and shapes. Highlighting not only it’s flexibility and adaptability but also it’s function as our own biological upholstery. That aside from it’s protective capabilities could also serve as a medium for aesthetic expression, maybe even in the form of a dress less fashion. Juuke Schoorl (1989) graduated from the Royal College of Arts in The Hague (NL) in 2014. With her photography Juuke tries to translate the things around us that we normally take for granted into something visually new and exciting. Her work is usually based on a hands-on process of experimentation. She likes to challenge the physical abilities of her subjects and tries to surprise the audience without the use of digital manipulation. 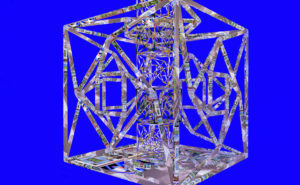 This piece is a meditation labyrinth, existing across physical and virtual dimensions. The pathway unfolds on the floor, with a collaged scape that is mimicked in the virtual space. Through the headset, the visitor can perceive the vertical dimensions of the scape by circumnavigating the cubical and eventually reaching the center of the labyrinth, which reveals an undulating upward channel. Brenna Murphy weaves trans-dimensional labyrinths using personal recording devices, computer graphics programs and digital fabrication. Her work is an ongoing meditation on the psychedelic composition of embodied experience across physical and virtual realms. She also works collaboratively with Birch Cooper under the collective name MSHR, producing interactive sound installations and ceremonial performances. Her work is represented by Upfor and American Medium. Breder’s work envisions an aesthetics of renewal; explores liminality and the concept of threshold consciousness. 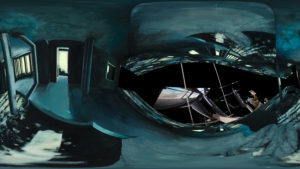 He studied painting at the Hochschule für bildende Künste Hamburg and was awarded the Studienstiftung des deutschen Volkes to study art in New York in 1964. His work was shown three times at the Whitney Biennial Exhibitions. Influenced by Malevich, Mondrian, and Kandinsky, Mr. Breder’s work follows this lineage of transcendental abstraction. In the Opsis series, the kinesis – the movement – is generated within the eye of the observer. 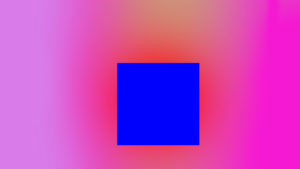 The canvas is fixed and rigid – but its image is caused to move and to change hues by the movement of molecules and ions in and out of cells in the observer’s retinas. 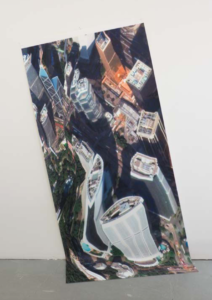 Clement Valla’s series The Universal Texture and Postcards from Google Earth are based on images he captured from the screen while traveling through the Google Earth interface. This collection of pictures emphasizes edge conditions, the result of an automated process that fuses aerial photographs and cartographic data. As the source imagery is culled from different periods and vantage points, anomalies in wrapping the 3-D projection model appear. Constraints of the algorithms are revealed, forging a hybrid geography. Valla’s postcard imagery landmarks a non- site: a space of impossibly tangled readymade highways that evoke network communication. These locations will inevitably be erased over time, as Google’s mapping system further analyzes and progresses. Similarly, the Universal Texture sculptures are playful in their questioning of photographic representation, as Valla returns the flat picture plane to three-dimensional reality. Clement Valla is a New York based artist. He has had recent solo exhibitions at XPO Gallery in Paris and Transfer Gallery in Brooklyn. His work was included in the “Paddles On!” auction at Phillips, organized by Lindsay Howard. 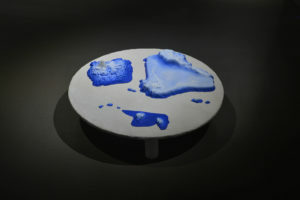 His work has also been exhibited at The Indianapolis Museum of Art, Indianapolis; Museum of the Moving Image, New York; Thommassen Galleri, Gothenburg; Bitforms Gallery, New York; Mulherin + Pollard Projects, New York; DAAP Galleries, University of Cincinnati; 319 Scholes, New York; and the Villa Terrace Decorative Arts Museum, Milwaukee. His work has been cited in The Guardian, Wall Street Journal, TIME Magazine, El Pais, Huffington Post, Rhizome, Domus, Wired, The Brooklyn Rail, Liberation, and on BBC television. Valla received a BA in Architecture from Columbia University and an MFA from the Rhode Island School of Design in Digital+Media. He is currently an assistant professor at RISD. His work has been cited in The Guardian, Wall Street Journal, TIME Magazine, El Pais, Huffington Post, Rhizome, Domus, Wired, The Brooklyn Rail, Liberation, and on BBC television. Valla received a BA in Architecture from Columbia University and an MFA from the Rhode Island School of Design in Digital+Media. He is currently an assistant professor at RISD. The fractals have also been processed through Google’s Deepdream, transforming the fractal landscapes into morphing psychedelic patterns that our eye will recognize as very familiar shapes although the way the images are created only aims to create a variety of random patterns on the canvas. 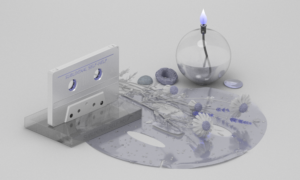 Matteo Zamagni is a new media artist based in London. He expresses his ideas through multi-media platforms: video direction, real-time and off-line graphics and interactive installations. The root of his projects comes from ongoing research into the connections between spirituality and sciences. He explores the boundaries between the physical and the invisible dimensions, the macro and micro scale of matter, the conscious & unconscious mind. NowForeVR is a unique journey through the metaphysics of art. Based on real acrylic paintings by the artist group ‘The Swan Collective’, the viewer will be able to fly through stereoscopic architectural models, projection-mapped with painted textures. The surround sound is spatial, making the experience very immersive. Get lost in endless architectural islands suspended in space, cascading for all eternity. The Swan Collective is the pseudonym of the artist Felix Kraus. He embodies five different artist figures created by him, each using his/her own technique. 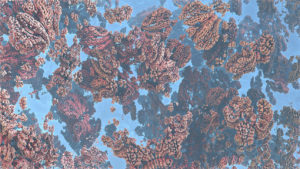 This results in multimedia works using 3D animation, painting, paper embossment, literature, photography and performance. Utopia 1.0 is a first-person expedition into the once thriving world of Second Life, an online virtual world launched in 2003. As the sun begins to set on the once bustling online pseudo-reality of Second Life, filmmaker Annie Berman sends her avatar in to investigate the decline of this utopian world to answer the question: Given the invitation to come build anything imaginable, what is it that we chose to create? 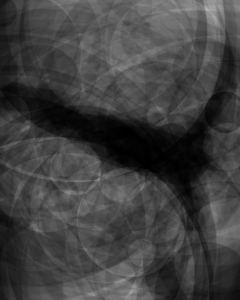 Approximation Theory is an art-research project in visual mathematics and data aesthetics. It consists of a series of prints that visualize the mathematical idea of approximation. The methodology used in the work involves the choice of a set of fixed dictionaries or databases of images. Each dictionary has its own distinctive quality. Any other image can then be reconstructed as a weighted superposition of all or some of the images in the dictionary. The character of the approximation depends on two kinds of factors: qualitative and quantitative. The qualitative aspect has to do with the character of images in the dictionary, for instance whether they are linear or curved. The quantitative aspect has to do with the number of images from the dictionary that are used in the reconstruction: the larger this number, the more faithful the reconstruction. Felipe Cucker (Montevideo, Uruguay) is Chair Professor of Mathematics at the City University of Hong Kong. His research covers a variety of subjects, including semi-algebraic geometry, computer algebra, complexity, emergence in decentralized systems, and the relations between art and mathematics, on which he published one book (“Manifold Mirrors”, Cambridge University Press, 2013). 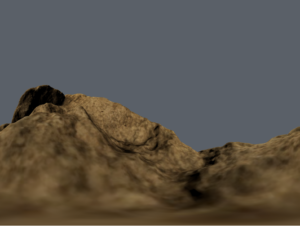 Hector Rodriguez (Las Palmas, Canary Islands), an Associate Professor at City University of Hong Kong, is an experimental software artist whose work investigates the specific possibilities of information technologies to reconfigure our experience of moving images and our relation to film history. 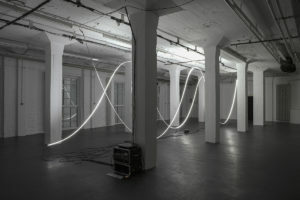 His work integrates video art with mathematics and computer science, exploring the tension between digital abstraction and cinematic representation. This works has been partially funded by CityU Research Project # 9610322. Art as a free platform provides alternatives for the researches of science and technology. Nowadays virtual reality and post humanism has became as an hot topic. The artwork reflects a feedback between human and technology, the digitalisation of human body’s internal processes and the use of biofeedback in the art. Electroencephalography which is commonly used in neurology science to record brain wave activity, here allows visitor to affect the sound of the sound sculpture using their mind power. Strings are tuned in half tone whole tone scale. Neurosky MindWave records beta waves which is characterised by concentration, attention state and active thinking. The higher the incoming beta signal, the higher tone has been played. Gunta Dombrovska during the studies of new media art, she started to combine sound with new media techniques thus creating experimental works of art. The main theme of her artwork is a digitalization of the biological processes and movements of the human body and using it as an element of interactivity to affect and control other processes and devices. 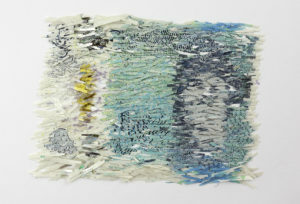 A Bank of England five pound note reconstructed from shredded production waste. An animation made form the security shredded remnants of misprinted new polymer Five Pound banknote (G series), which never made it into circulation. Made possible with the support of the Leverhumle Trust and the Bank of England. Martin John Callanan is an artist researching an individual’s place within systems. Sayonara Hashima takes as its subject Hashima, an island off the coast of Japan with a fascinating history. Entirely manmade, the concrete island served as a coal-mining operation that, at its peak of operation, housed some 5000 inhabitants, at that time the most densely populated place on earth. Abandoned in 1974, when its mineral resources had been exhausted, the island has since taken on a ghostly, mythic status in the national imagination, aided by its appearance in a Battle Royale II, a recent Japanese adventure/science fiction film. Nina Fischer & Maroan El Sani explore the changing roles of the island throughout its history, capturing the accounts not only of former inhabitants but also the current impressions of high school students of a place they know only indirectly through representations. As with many of Fischer & El Sani’s previous projects, Sayonara Hashima asks how memory operates, how a site wears its history, both physically and metaphorically. Nina Fischer and Maroan el Sani are visual artists and filmmakers, based in Berlin. They have been working together since 1995. From 2007 until 2010 they have been Associate Professors for Film and Media Art at Sapporo City University, Japan. Since 2015 Nina Fischer is Professor for Experimental Film and Media Art at Uninversity of the Arts, Berlin. They have been recipients of the Karl-Hofer-Prize of the University of the Arts, Berlin and were awarded several artist in residence stipends e.g. at German Academy Villa Massimo, Rome, DAAD in Tokyo, Cité des Arts in Paris, Stedelijk Museum in Amsterdam and Villa Kamogawa, Kyoto. Two animated still life compositions portraying the so-called “self-care” and “self-hate” communities, that have formed online based around specific aesthetics and lifestyle choices. Both are on the opposite ends of a spectrum — either moralizing about wholesomeness, spreading naive positivism and relying on superstition, or romanticizing mental illness through exhibitionism of self-harm, depression, suicide and self-loathing under the pretext that it is beautiful and deep. Having observed and partly dabbled in both of these internet phenomenons herself, the author has gathered objects that visually represent these communities and arranged them in shrine-like compositions. In 2013 volcanic eruption caused the appearance of a new island in the Pacific Ocean – maritime set of an ongoing dispute between neighbouring nations. The rise of Nishinoshima caused the expansion of Japans Exclusive Economic Zone (EEZ) – an area which stretches 200 nautical miles of a national coastline, allowing individual countries to exercise sovereign and jurisdictional rights such as the exploitation of resources. The Volcano Island catalyses the ongoing economic and geopolitical conflict of the East China Sea and its undefined borders. ‘Proximity of the Enemy’ (2016) uses various artefacts to reenact the sudden rise of the Island and its political and environmental implication. Outcomes are not contained objects, but rather a point of departure replicating the ridiculousness of a maritime dispute and the past and future of the island. Greta Hauer (1984, Germany) lives and works in London. Her works crosses reality and the fiction by observing and reenacting environmental, cultural and political systems. Through an extensive research into a place, condition and history projects result in the fabrication of narratives often presented in form of simulations, objects and films. Hauer completed her MA at the Royal College of Art (2014). Recent exhibitions include All’s One, Roomservice Gallery NY (2016); Of The Sea, Chatham Historic Dockyard (2016) and Things We Didn’t have Before, Pumphouse Gallery (2015). Hauer recently participated in a residency at Villa Lena Art Foundation (2017) and Roomservice Project Space (2016). Next to her practice she is teaching at Goldsmiths University. Light, as we usually interpret it, is an element without mass and gravity. For “the weight of light” dots of light appear to have mass, momentum and kinetic energy on physical paths. One simulates the expected behaviour while the counterpart inverts gravity, causing us to experience a fictional space of light. The installation plays with our sense of reality and emphasizes the materiality of immaterial elements in an revolving reality which overcomes the dualism of “virtual” and “real”. Therefore “the weight of light” goes beyond expected behaviour. Thus the matter of light traverses a re-interpretation of our known reality. Each moving light dot is underlined by an auditive representation in the range of low frequencies. Phenomena of standing sound waves and frequency interferences support the shape waved structure. Thereby an immersive space is created where the movement of light is also represented by vibrational patterns of oscillating sound waves. Andreas Muxel creates artifacts and spaces for all senses blurring the boundaries between the analog and the digital, the physical and the non-physical. He has been working in the fields of design, art and technology for over a decade establishing new possibilities through the tools he make. He lives and works in Cologne and Augsburg. A fictional proposal to bring back the Drachma, one of the world’s oldest yet ‘dead’ national currency of Greece: Bacteria living on the surface of the old banknote is collected and altered, to function as a sensor of Greek economy. 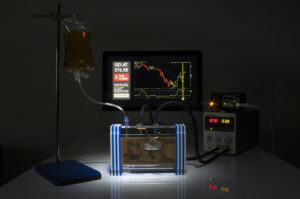 The bacteria respond to series of electrical stimulations generated from the rise and the fall of Greek stock market, known as Athens General Index. At a brink of financial crash, bacteria glow brightly as a warning signal to an impending crisis. During recession, the bacteria release enzymes that degrade cotton fibres of the banknote, rendering the currency useless again. The banknote effectively transforms into God Zeus, throwing lightning at its bacterial citizens, and foretelling country’s fortunes and tragedies. Raphael Kim is a bio-designer and researcher, who uses molecular biology as design material, process and narrative outcomes. A graduate and a former visiting lecturer from Design Interactions at the Royal College of Art, and currently undertaking PhD at Media and Arts Technology, Queen Mary, University of London. 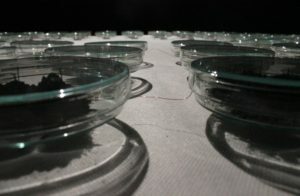 Interests lie in the social and cultural implications of biotechnology, narrated through a combination of speculative design and hands-on bio-digital experimentation. Long-term records of structures of the weather, when the light becomes the main fluid and creative element, are time framed by the movement of the sun. Resulted synthetic studies, in the form of large sized prints and immersive “skyscape” audiovisual compositions, interpret everyday drama above our heads – in the atmosphere. It is primarily the light which cultivates natural ecosystems and spiritual balance of human. Installation allows us to look at the nature from different perspective, with the organic picture of the past. We can see colors of the weather and inevitable borders of the light, changing with the transfiguration of seasons. Michal Kindernay is an intermedia artist, curator and performer. 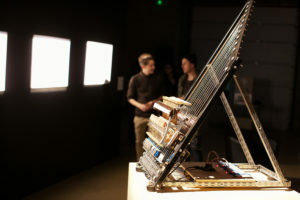 His audio-visual installations interconnect art, technology and science. He reflects ecological issues through various technological approaches in relation to nature environment. 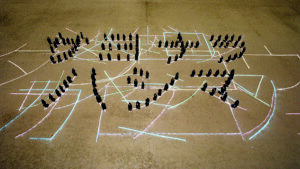 His works include video performances, interactive installations or experimental documentary projects or sound compositions. He is one of the founders or yo-yo non profit culture organization, RurArtMap project and he was part of Školská 28 gallery collective in Prague. He is an external teacher in Centre of Audiovisual Studies in Film and TV School of Academy of Performing Arts and in new Masters program in Prague College. As organizer or artist he was involved in many international projects. He works and lives in Prague. Philosopher and Ecologist Timothy Morton wrote that “ecological awareness consists precisely in concepts such as world and place evaporating, leaving behind real entities that are far closer than they appear in the mirror of human conceptuality.” The framing of ‘the world’ and of ‘place’ as grand unifying ideas that define communities is idealized, distancing humans from the inhabited planet and it’s eroding resources. World and Place Evaporating examines layers of reality that both dissipate and reveal, shifting orientations that become incursions on our comfort, and the ever shifting framing of our point of reference that highlight the narratives we tell ourselves about what we’ve done. Christopher Manzione is the founder and director of the Virtual Public Art Project, an organization that uses Augmented Reality to produce original artist works in public space. 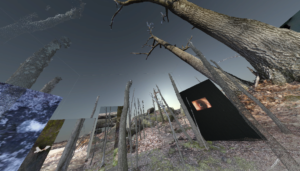 Manzione most recently presented the virtual reality artwork World and Place Evaporating as part of the Moving Image Art Fair (17) along with last year curating and showing in Space Between the Skies at Apex Art (16). In addition he has received a 2014 Fellowship through Franconia Sculpture, he was a 2013 Fellow for New Jersey State Council on the Arts, artist-in-residence at William Paterson University’s Center for Computer Art and Animation (11), Socrates Sculpture Park (Emerging Artist Fellowship, 2010). He has shown nationally and internationally at venues such as the Boston ICA, Abington Arts Center, Alt Art Space Istanbul, Philadelphia International Festival of the Arts, the Surry Hills Festival in Melbourne, and Gurzenich Koln Museum in Cologne. He is currently an Assistant Professor in Visual Arts and Technology at Stevens Institute of Technology. Seth Cluett is an American artist whose work includes installation, concert music, performance, photography, and critical writing. His “subtle…seductive, immersive” (Artforum) work has been characterized as “rigorously focused and full of detail” (e/i) and “dramatic, powerful, and at one with nature” (The Wire). The recipient of awards from Meet the Composer, the Andrew W. Mellon Foundation, and the Foundation for Contemporary Arts Emergency Grant his work has been presented internationally at venues such as the Palais de Tokyo, the Whitney Museum, MoMA PS1, STEIM, Apexart, and Eyebeam. He has published writings with Tacet Revue, Leonardo Music Journal, and the Journal of the Acoustical Society of America, and his creative work is documented on the Line Imprint and Errant Bodies Press as well as Sedimental and Winds Measure Recordings. In the fall of 2015 he joined the faculty of Stevens Institute of Technology in Hoboken where he is jointly appointed in the programs in Visual Arts & Technology and Music & Technology. Mélodie Mousset (*1981 in Abu Dhabi) is a french artist based in Zurich, Switzerland. Oscillating between virtual and physical realms Mélodie’s work focus on the physicality of the human body and the potential virtuality of the mind. Her investigations develop through numerous mediums, including: performance, video, installation, photography, sculptures and interactive media. She received the Swiss art award for her first VR installation “We were looking for ourselves in each other” in 2015 and her work is regularly exhibited internationally. Mélodie is a regular visiting professor at ECAL, Switzerland since 2015. She has studied at EBAR (FR), ECAL (CH), RCA (UK) and completed her Master of Fine Arts at CALARTS (USA) in 2012. Created in 2017 HanaHana 花華 is an outgrowth of Mélodie’s ongoing exploration of the liminal space between technology and self. Naëm Baron discovered Virtual Reality in 2006 to become an expert in this field, since then he worked on scientific research, videogames and art. Driven by his passion for the imbrication between human and computer, in 2010, he got a MSC in computer science with a specialization in VR. 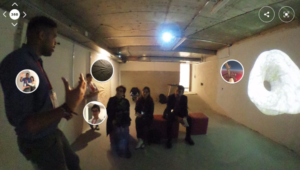 After a first professional experience working in the industry, he joined the University of Geneva to setup the VR laboratory as a technical manager. He took part in multiple research projects on affective sciences, psychology and neurosciences. In 2015, he worked on Mélodie’s first VR artistic experience, laureate of the “Swiss Arts Awards 2015”. This new interest for art leads to a new collaboration in 2016, HanaHana 花華. Digital Nomads is an research archive of documentary portraits presented as a live mixed film. Artist Julia Sokolnicka collects documentary and found footage and edits it in live essay-film shows and installations. The archive grows while the research proceeds. The artists focuses on the dichotomy between real and virtual spaces and emphasizes the importance of gesture and emotional education in multicultural commoning. Investigation attempts to grasp modern utopias of global, social movements and models of community bonding. 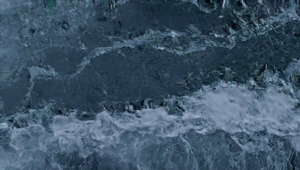 The project discusses underground in gentrified metropolia and sustainability within new technologies as a scheme of communication.Each presentation is different and adjusts to audience and current topics, sculpting and reshaping the archived footage. The project is ongoing and has yet been realized in Amsterdam, Berlin and New York. Julia Sokolnicka born in Warsaw in 1983 is an experimental and documentary filmmaker basedin Amsterdam. She’s an author of music, and dance videos and visual concepts for theatre andcommercials. As a researcher she moves between social philosophy, video and performance. ants in the legs is an absurdist alien pop image agency of decentered fiction-science ‘healthy lifestyle choice’ scenarios, abstracting the mimetic data economy spectacle. The project is inspired by the contemporary nexus of cinema, film and video art under the influence of the internet. 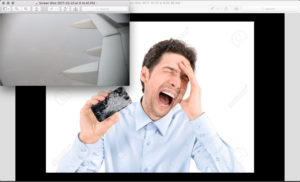 The research involves an improvised deconstructivist approach to the moving image, addressing complexities surrounding identity as the site of exchange and consumption within the limitations of patriarchal capitalist linear narrative genre cinema and social media networked public mimesis. Through an experimental mix of anti-performance, elliptical and overtly iconic modes of cinematic representation, the project engages questions of cinema beyond dogma and affinity after identity, abstracting tropes and affects in light of the internet data economy spectacle.